Trigger finger is a common disorder causing triggering/snapping or even locking of a finger or the thumb. In medical terms it also known as stenosing tenosynovitis. The flexor tendons are like long strings that connect muscles in the forearm with the fingers and allow the fingers to bend. All flexor tendons enter a narrow tunnel as they go into the fingers. In trigger finger the entry to the tunnel is narrowed due to thickening of the outer lining of the mouth of the tunnel (also known as the A1 pulley) and a small lump in the tendon. The swelling and the lump stop the tendon from gliding freely in and out of the tendon tunnel. 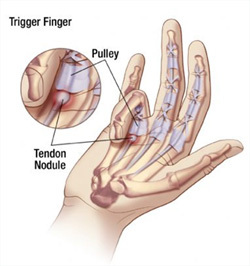 The tendon „catches“ as it glides under the A1 pulley and the finger clicks or triggers. In severe cases the lump in the tendon can get trapped and the finger gets stuck and locked in a bent position. Forceful straightening of the finger/thumb is usually accompanied by a painful snapping or clicking sensation. What are the causes of trigger finger / trigger thumb? The precise cause is not always clear in every patient. Some systemic diseases can have an effect on soft tissues leading to swelling and thickening like rheumatoid arthritis or gout. Patients with Insulin-dependant Diabetes are particularly at risk. Some patients seem to be prone to developing trigger finger. What are the non-operative treatment options ? In most cases an attempt at treatment without surgery is appropriate.If an underlying cause can be identified, then treating this condition or avoiding/modifying the offending activity can make a difference. Intermittent splinting and anti-inflammatory medication sometimes help in the early stages of trigger finger / trigger thumb. Injections with steroids can be very useful and often cure the problem. Injections are usually not used more than twice in the same finger, as there is a risk of tendon rupture with excessive use of steroids. Fingers that are permanently locked and/or have not responded to other treatment require surgical intervention. Surgery is best carried out as a day case under local anaesthetic. A small cut is made at the base of the finger in the palm. The mouth of the tendon tunnel (the A1 pulley) is simply divided to allow free gliding of the tendon. During surgery the patient is asked to move the finger. The surgeon can then see, whether the constriction has been adequately released. Any inflammatory tissue that might contribute to the problem is removed. Fine sutures are used to close the wound; a small dressing and a bulky bandage are then applied. Patients can mobilise more or less straight away within limits of discomfort. The bulky outer bandages can be removed after 3 days following surgery. A small dressing is left in place to protect the wound while it heals. The wound will be checked after 10-14 days and any residual suture material will be removed. Most patients are able to use their hand for light activities within a few days. Return to work depends on the patient’s occupation and can range from a few days to 3 weeks. The scar: The scar can become tender. It may feel tight and cause pain on stretching the finger. Massaging the scar with moisturiser will help to soften the scar. Scar/ keloid (scar): This may grow thickened, red and painful (also known as keloid scar). This is more Common in Afro-Caribbean people. Complex Regional Pain Syndrome (CRPS): this is pain that continues long after one would expect and is much greater than one would expect after a small scar. There are various techniques that are helpful in relieving CRPS. These include massage, splintage, physiotherapy or injection with medicines such as guanethidine. Damage to tendons: damage to tendons may cause loss of flexion of those fingers/parts of the hand. This may require repair. Nerve injury: extremely rarely the digital nerve itself can be damaged causing Numbness. The nerve will have to be repaired. Continued triggering: This happens if the release was not complete. The procedure may have to be repeated. Recurrence of trigger finger: A very rare problem. Splints may work in less severe trigger fingers, but are not always liked by all patients. They have to be worn for several weeks to work. The success rate can be up to 60% (5). Many different types of splints have been described with different regimes. Surgery is very successful with a low complication rate of less than 5% (3,4). Baumgarten KM, Gerlach D, Boyer MI. J Bone Joint Surg Am. 2007 Dec;89(12):2604-11: Corticosteroid injection in diabetic patients with trigger finger. A prospective, randomized, controlled double-blinded study. Rozental TD, Zurakowski D, Blazar PE. J Bone Joint Surg Am. 2008 Aug;90(8):1665-72: Trigger finger: prognostic indicators of recurrence following corticosteroid injection. Lim MH, Lim KK, Rasheed MZ, Narayanan S, Beng-Hoi Tan A. J Hand Surg Eur Vol. 2007 Aug;32(4):457-9. Epub 2007 May 4: Outcome of open trigger digit release. Finsen V, Hagen S. Hand Surg. 2003 Dec;8(2):201-3: Surgery for trigger finger. Rodgers JA, McCarthy JA, Tiedeman JJ. Orthopedics. 1998 Mar;21(3):305-9; discussion 309-10: Functional distal interphalangeal joint splinting for trigger finger in laborers: a review and cadaver investigation.